This has been a really engaging Roland Garros, which has featured the welcome emergence of new faces at the business end of a Grand Slam. Ernests Gulbis, love him or hate him, is a character and his tennis this week has been terrific. Gulbis produced his best performance of the week, tournament and year to defeat Tomas Berdych in the quarter-finals, 6-3 6-2 6-4 in just one hour and 59 minutes. The Latvian world number 17 has now taken out Roger Federer and Berdych, and will try to complete the hat-trick of top ten scalps up against Novak Djokovic in the semi-finals. Djokovic has lost just one set all week (to Marin Cilic in the third round) and is looking in great form as he bids for his first French Open title and the Career Slam. In the quarter-finals, he defeated Milos Raonic, 7-5 7-6(4) 6-4, hitting 37 winners to 19 unforced errors in another fine performance. The Serb will face a match of unknown quantities against Gulbis. The Latvian player is one that is hard to call in terms of what he will bring out to the court. This is his first ever Grand Slam semi-final, but you get the sense he won’t be that phased by it. 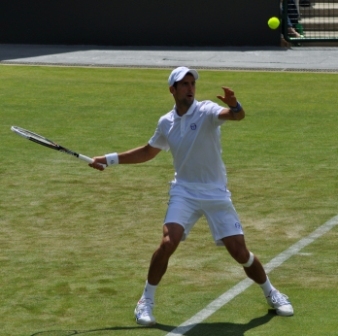 Djokovic leads the head-to-head with Gulbis by four wins to one. They haven’t played since 2011. Djokovic won their last match handily, 6-0 6-1 at Indian Wells. The Serb also won their only match on clay at Roland Garros in 2008, 7-5 7-6(3) 7-5. Gulbis has been great, but Djokovic is a significant step up from Federer and Berdych. I could see Ernie getting a set, but winning the match would be pretty astonishing. The Serb has his eyes on the prize and won’t give up his chances without a ferocious fight. I’d love to hear your thoughts on this semi-final… does Ernie stand a chance? June 5, 2014 in ATP, Djokovic, Gulbis, Roland Garros. I would love to see Ernie winning this. Not that I think he says particularly smart stuff in his interviews but he definitely is a character that the tennis world needs. I feel he has a chance when he is bringing the same tennis he has shown against Berdych and Djokovic is too ambitious (which could definitely happen!) but I think you’re right with your 4-set-prediction!